Margaret Jean Hill passed away Monday January 28, 2019. Margaret (Jean) was born September 10, 1928 in Miami, Arizona to William Earl Boyd and Virgie Juanita Mullins Boyd. She lived in several places throughout the western United States as a child, but eventually her family settled in Weiser, Idaho. After WWII, Jean married Bob Hill and they moved to Moscow, Idaho. 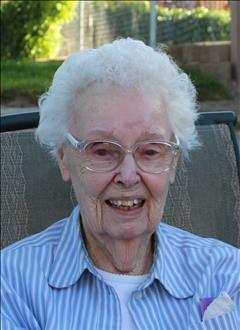 They later settled permanently in Pocatello, Idaho, where Jean raised three children. Jean was a wonderful wife, mother, and grandmother. She loved reading, dancing, and music. She also collected dolls, Santas, and nutcrackers. She loved spending time at their cabin in Island Park, especially snow machining in the winter. After Bob retired, they split their time among Island Park, Pocatello, and Tucson, Arizona. Jean traveled to many places in their motor home, including much of the US and Mexico. She also went on many world adventures which included a cruise down the Nile River, seeing the Egyptian pyramids, and traveling through much of Europe. Her all-time favorite trip was Machu Picchu, Peru. She loved telling stories about her childhood and all her life adventures. Jean is survived by her three children John (Dee), Bonnie, and Nancy and her eight grandchildren Heidi (Jerry), Jessica, Rebecca, Gretchen, Katie, Chad, Sean, and Robby. She is also survived by fifteen great grandchildren, 4 great- great grandchildren, a brother Bill of Weiser and sister Darlene of Boise. She is preceded in death by her parents, husband, four brothers, and a son-in-law. Jean will be greatly missed by all who knew her. She was our angel on Earth. The family will have a celebration of life at a later date.